* Features music created individually by all four members of the band and made into a sound collage in two parts. * Premiered at the Solomon R. Guggenheim Museum as part of a guest exhibit by the band, live recordings of which also feature on the record. * Released on Record Store Day and limited to 5000 copies. Two years after performing Transverse Temporal Gyrus at New York City’s Guggenheim Museum, Animal Collective will release a 12-inch of their sound collaboration with ODDSAC director/visual artist Danny Perez for Record Store Day on April 21st. The record will include the initial sounds and songs each member recorded before being put through a randomizer at the museum, as well as pieces of live recordings from that evening. Also included in the packge will be a limited edition randomizer schematic poster. While the physical release will be limited and strictly for RSD, the Animals will launch a website that will recreate the sound program they used in the performance with accompanying visual content by Perez. Animal Collective fans are still waiting for the eclectic weird pop troupe to drop their proper follow-up to 2009′s celebrated Merriweather Post Pavilion, but the group will attempt to sate their devoted when they issue a new 12-inch featuring the sounds to their 2010 Guggenheim Museum installation, Transverse Temporal Gyrus. Domino Records announced that the score, which accompanied visuals prepped by longtime collaborator Danny Perez, will pop up on vinyl this Record Store Day (April 21). Avey Tare (born David Michael Portner, April 24, 1979) is a musician and founding member of Animal Collective. Portner lives in Brooklyn, NY. Noah Benjamin Lennox (born July 17, 1978 in Baltimore, Maryland) also known as Panda Bear, is an experimental musician and a founding member of Animal Collective, currently based in Lisbon. 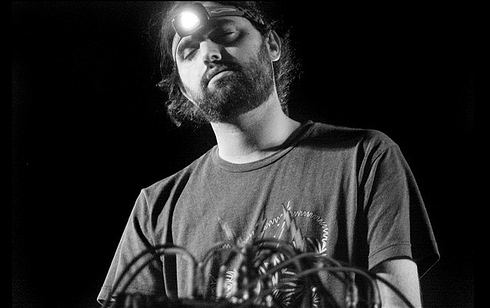 Geologist (born Brian Ross Weitz on March 26, 1979) is a founding member of Animal Collective. He provides electronic sound manipulations and samples for the band. The Geologist's nickname comes from the caving headlamp he wears in order to see his electronic equipment during live shows. Deakin (born Joshua Caleb Dibb) is an avant-garde musician and a founding member of Animal Collective. Avey Tare (David Portner; vocals, guitar, synthesizer, sequencer, keys, piano, percussion) – Name comes from "tearing" apart the name David (Davey), hence Avey Tare. It is not related to the word "avatar". Panda Bear (Noah Lennox; vocals, percussion, samples, synthesizer, electronics, guitar) – Name comes from the panda he drew on the first set of songs he ever wrote. Deakin (Josh Dibb; synthesizer, guitar, vocals, percussion, sequencer, midi xylophone) – Name comes from letters he used to write to other members under the name Conrad Deacon. He has used different spellings of the name on different albums: "Deaken" on Here Comes the Indian, "Deakin" on Feels and "Deacon" on Strawberry Jam and the single "Grass". Having been absent from the band's tours since early 2007, he began a solo tour in 2010 (using the spelling "Deakin" at the request of fellow Baltimorean musician Dan Deacon, in order to avoid confusion). He rejoined the band in 2011.